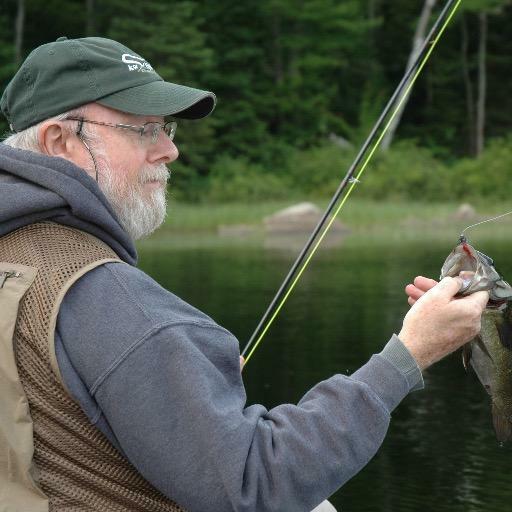 CAMBRIDGE — June is the month when our thoughts begin meandering to the lazy, hazy days of summer and to summer activities such as canoeing, kayaking, hiking and fishing, not to mention open-air artistic endeavours. Consequently, thoughts turn to lakes, streams and rivers. For many who live in Waterloo Region and its immediate environs, rivers mean the Grand. Anyone who views the Grand as a natural treasure, as a home water or as a defining geological and biological factor in the local landscape, will not want to miss The Grand River Suite. The exhibition devoted to the watershed in all its glory was on view at Idea Exchange, located in the Preston library branch, through June 27. The Grand River winds its way through 300 kilometres of southwestern Ontario from Luther Marsh in the highlands of Dufferin County, to Port Maitland on the north shore of Lake Erie. Designated a Canadian Heritage River in 1994, the Grand connects some of the province’s most alluring ecosystems, including the Elora Gorge and the country’s only Carolinian forest. Similarly, it has played a vital role in the area’s history, extending back 11,000 years to when indigenous people settled along its banks, through colonization by European missionaries and settlers in the 17th century. Formed when the last glaciers retreated 12,000 years ago, the Grand continues as an influential player in a post-industrial, multinational and transglobal landscape that supports a million residents in 40 municipalities. 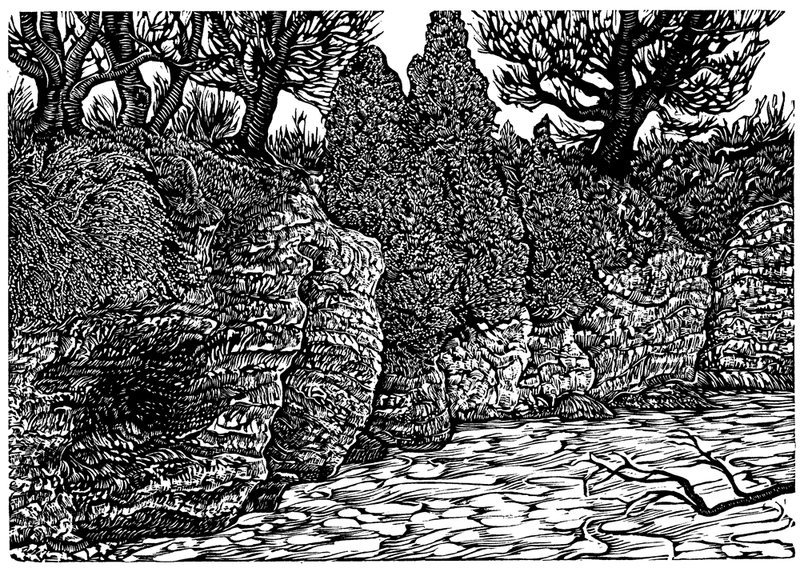 Stratford artist Gerard Brender à Brandis celebrates the river’s many moods, textures and colours in The Grand River Suite, an exhibition of 67 wood engravings. 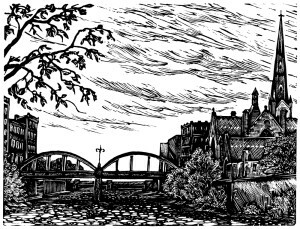 The black/white prints anchor The Grand River, published by Porcupine’s Quill. 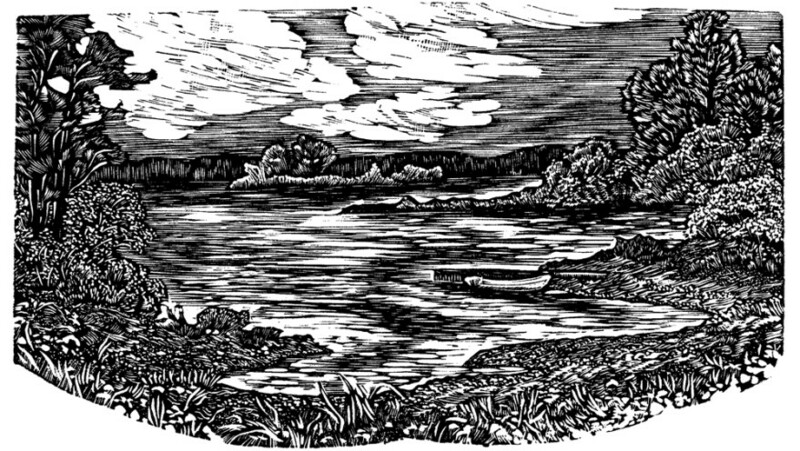 Subtitled Dundalk to Lake Erie, the book is an artistic partnership with his sister, Stratford writer Marianne Brandis. Brandis ruminates on the notion of “riverness” before exploring the river’s geography and history, ecology and some of the influential people who called the watershed home, in addition to preservation and remediation strategies. The heart of the book, which is a travelogue in image and text, consists of short, meditative essays that complement Brender à Brandis’ engravings. The book is an evocative blend of convergences or connections, conversations or dialogues between country and city, agriculture and industry, recreation and labour. The prints collected in The Grand River Suite are the actual size of the 58 images published in the book, ranging from three by three centimetres to 10 by 18 centimetres. 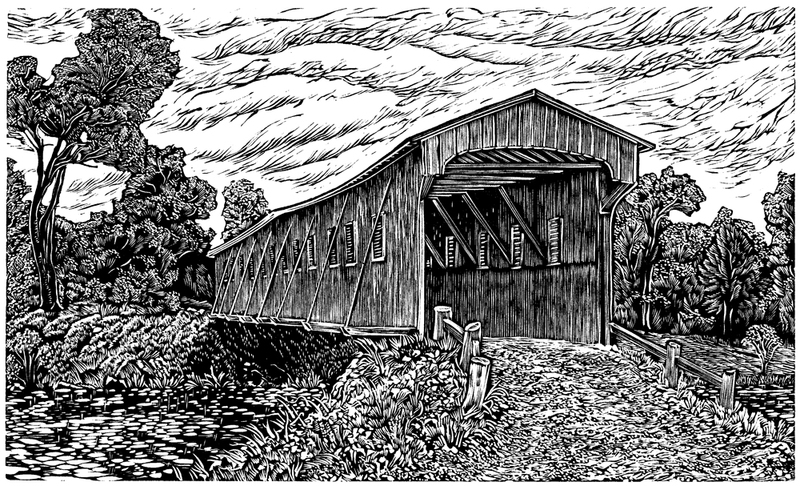 The images combine portraits of the river with images of flora and historical buildings, from the covered bridge at West Montrose and Mackenzie King’s childhood home at Woodside to Blair’s Sheave Tower and the Bell Homestead in Brantford. The images resemble impressionistic postcards collected for a family album to commemorate a memorable trip. Although the images are representational, serving as historical visual documents, Brender à Brandis’s concerns are not restricted to verisimilitude. 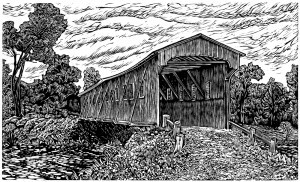 He constructs his images on wood blocks in his cottage studio from plein air sketches. 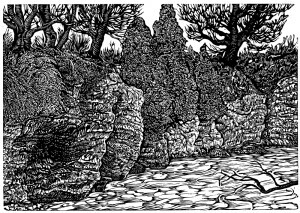 The process of transformation from drawing to engraving entails innumerable aesthetic decisions. No line is left to chance or randomness. The prints are meticulously detailed, even delicate. While static, many convey a sense of movement, whether flowing water or clouds in breezy skies. With The Grand River Suite and The Grand River, viewers and readers alike accompany brother and sister, writer and artist on a leisurely journey through the seasons from the Grand’s source to its mouth. 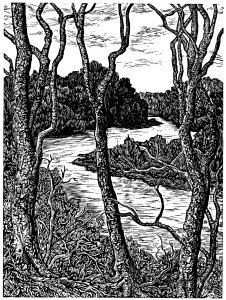 Past and present meet at the river, representing the flow of time, the mortality of those who lived along its banks and the timelessness of art and story. Anyone who has cause or occasion to appreciate the Grand River, will be moved and touched by this living creative memorial.